Koh Gen Do Soft Gommage Spa Gel is a scrub - and a bit different from the usual ones. It doesn't have any scrubby bits in it and from what I figured out, it doesn't use any AHA/glycolic acid, etc., for exfoliation. Instead, this is a gel formula that is massaged on to cleansed, dry skin, and as it's rubbed into the skin it rolls up into small flecks/clumps and picks up dry, dull skin bits as it moves along. I have tried gommage scrubs at a counter before, but this is my first time buying one and using for any prolonged period of time. Sephora has been having these Urban Decay lipstick samples as part of their GWP lineup off and on for quite some time now. I checked swatches online and figured none of those were colors I would ever use. 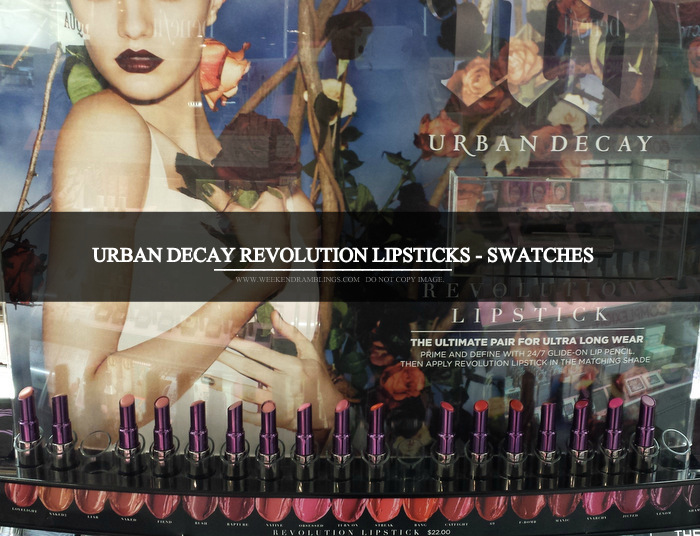 A few days back, though, I was at the Sephora store and decided to get swatches of the Urban Decay Revolution lipsticks. The formula seemed quite nice, and I loved how bright and pretty the colors looked. My next couple of orders from Sephora got me a couple of these lipstick samplers, and here's my favorite among the lot - Anarchy. On my nails today is Sephora by OPI - Under My Trench Coat. This is a dusty greyish taupe with very fine gold shimmer scattered throughout. Truth be told, this looks quite unimpressive in the bottle, and had I not bought this online I doubt if I would have ever bought it. The color is a soft neutral color on my nails, and the gold shimmer shows up as subtle flashes only under sunlight or artificial lighting. I used two coats to get a perfect, opaque finish, and topped with a clear topcoat. Scroll on for more photos. Urban Decay's Revolution Lipstick is a rich, buttery lipstick packed with the signature Urban Decay pigment-rich color. Made with a nourishing blend of jojoba oil, avocado oil, cocoa butter and shea butter to keep lips super moisturized and cushiony soft, the Revolution Lipstick glides on without dragging or skipping and hugs every curve. Just one swipe gives a big, gorgeous lay down of color, and with shades that range from gorgeous nudes to bold brights, there’s something for everyone. Here's a look at some photos and swatches. Thierry Mugler Womanity is the first sweet and savory fragrance creation. An engaging, mysterious and unique scent full of contrast built around the theme of the fig fruit, a powerful symbol of femininity, with an exceptional fig and caviar accord. Designed by Thierry Mugler, the bottle is a sculpted work of art with multiple secret symbols created for a woman who leaves her mark. Fragrance Notes: Fig leaves, fig, caviar, fig tree, rockrose. All About Shadow Quads feature four versatile, complimentary shades to wear alone or layer together in different combinations. For dark skintones, lighter shades will impart a more dramatic look and dark shades for a more natural style. Dark shades look more dramatic on fairer skins; light ones look more natural. 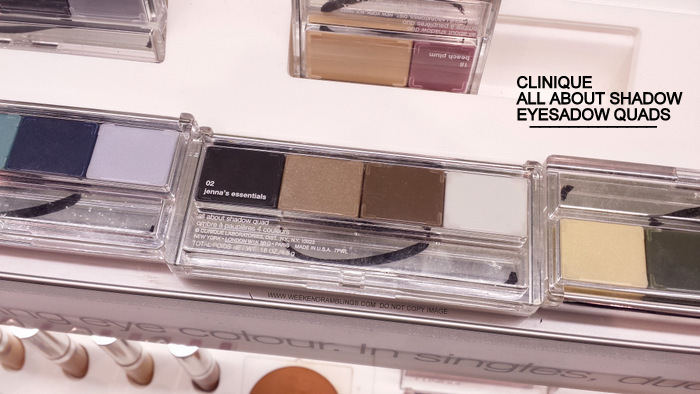 These powder colors are formulated to be crease and fade resistant, and are ophthalmologist tested for contact lens wearers and those with sensitive eyes. This set includes a mirrored compact with illustrated instructions plus two sponge-tip applicators. I haven't tried very many Clinique eyeshadows apart from a blush-eyeshadow set that I got as part of a GWP some time back. In general, though, I love the subtle, wearable colors that Clinique makes. Do the newly reformulated "All About Shadow" eyeshadow quads live up the trend? Scroll on for photos and swatches. The legendary fashion illustrator's vibrant energy and love of life inspire a striking colour collection featuring: Eyes x 6 Palettes, Lips x 3 Palettes and Face Palettes perfect for highlighting natural tones and contours. Each palette's packaging features an exclusive drawing by the artist, making these limited-edition objets d'art to be treasured. Found the Antonio Lopez for MAC makeup collection lying quite ignored over at the Nordstrom counter. Guess everyone bought everything they wanted or most products were just sold out or something - or it was just my lucky day 'cos I could swatch away peacefully with nobody bothering me about buying anything :D Here's a look at the three eyeshadow palettes - Teal, Violet, and Creative Copper. Hanae Mori Parfums Eau de Collection No. 8 (product provided for review) is the grand finale of the remarkable Eau de Collection series. Inspired by the aroma of Japanese cherry blossoms and filled with notes of Kyoto cherry blossom, plum nectar, and passion flower, No. 8 is a delicious gourmand fragrance. Reminiscent of lush flower gardens in Asia, topped with fruity delicacies from Europe, this sweet scent is a blend of east meets west- a signature of Hanae Mori’s fashion. Chanel Paradoxal is a dusty greyish purple nail polish with reddish violet shimmer mixed in. The shimmer, of course, is typical Chanel - visible only when the light hits it, under sunlight or artificial light, and more obvious in the bottle than on the nails. The color was launched a couple of years back and is, I think, a part of their permanent line of nail colors. I have lost count of the number of times I have added this to my basket and put it back because it seems such a dull-looking color. I finally got this about 2 months back and didn't bother using it until recently. Such is the appeal of the color :P With the weather starting to cool down here, though, I find this a perfect color to use. Scroll on for more photos. Inspired by Ruby Woo's overwhelming popularity and one-of-a-kind texture, MAC introduces new bold shades in its Retro Matte finish. Eye-catching colours like Dangerous and All Fired Up create a look that's fiercely feminine. 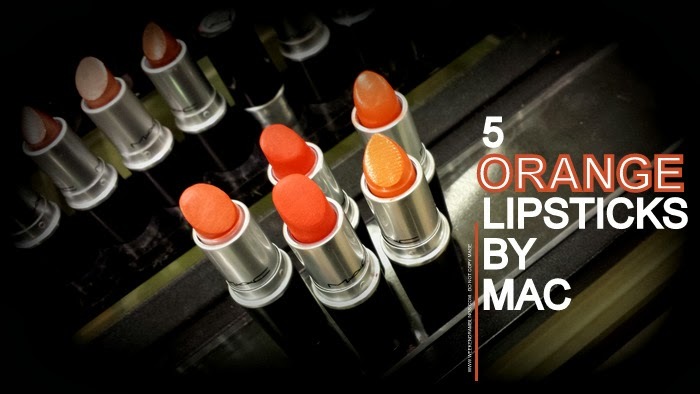 MAC also premieres Pro Longwear Lip Pencils in a vibrant colour palette, giving this long-lasting and transfer-proof lip pencil an exhilarating makeover. Here's a look at some swatches. An extraordinary range of stunning, high-pigment shadows for rich color payoff in 10 new shades. Be as rebellious as you want to be with this palette of 10 after-hours approved shadows in the deepest jewel tones, the prettiest metallics, and one scene-stealing pink. 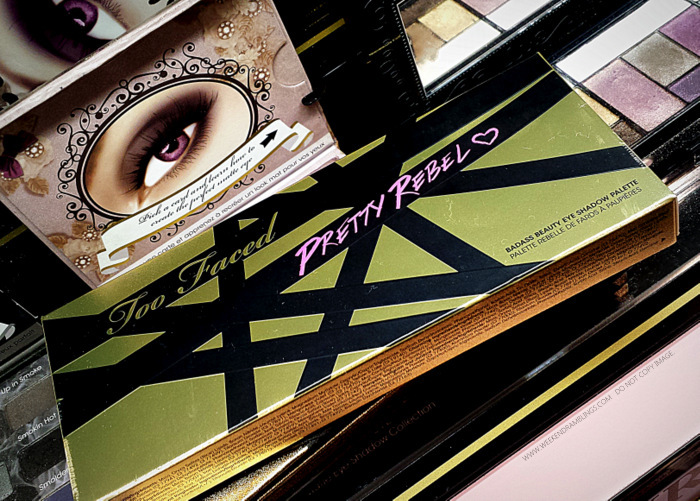 Also included is Too Faced’s signature Glamour Guide containing three eye looks that were designed to take the guesswork out of getting gorgeous. This set contains 10 x 0.05 oz eye shadow in Dainty, Charming, Girly, Totally Fetch, Miss Sparkles, Ringleader, Gangsta, Instigator, Badass, Jailbird. Formulated without parabens. Scroll on for photos and swatches. Available in thirty-two shades created by Tyen, Creative Director for Dior Makeup, Rouge Dior illuminates all types of beauty. Luminous, essential, and perfectly adjusted in pigment and intensity for just the right tone, so that every woman can find her signature color. Each shade features a name inspired by the world of couture and enhances the smile with a satiny finish, to rival the most refined fabric. 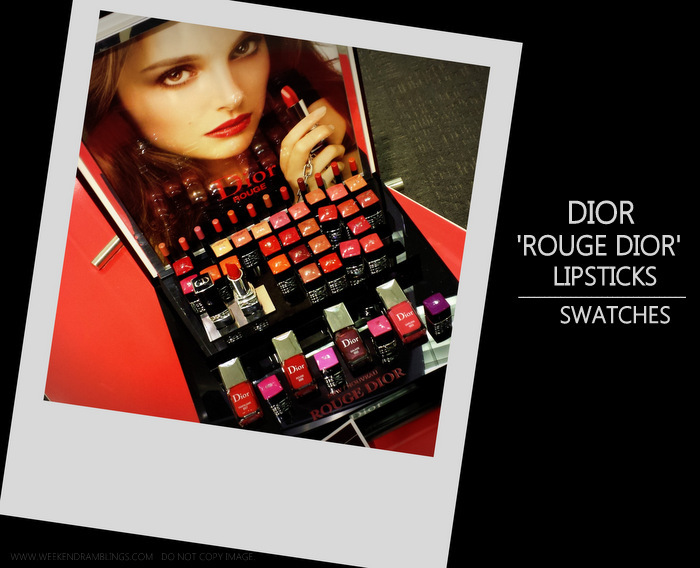 Rouge Dior, a totally couture lip color. The four It-Shades set the perfect tone for couture elegance: 999 - an iconic red, 743 Zinnia Red - a voluptuous red, 976 Prune Daisy - intense sparkling plum, and 765 Montmarte - a fiery diabolical red. Scroll on for swatches. Taking inspiration from the multifaceted life of Katie Holmes, an all-in-one palette for eyes, cheeks and lips lets you transform your look for work, evening and the weekend. A chocolate-colored fabric cover resembling Katie’s favorite daily planner offers discreet style on-the-go. Apply eyeshadows one at a time or create a soft highlighter for the face by sweeping the brush along the palette’s lightest shades. Pot Rouge also makes it a snap to touch up your lips and cheeks. Included in the palette are 8 eyeshadows, 2 pot rouges, and 1 pencil eyeliner. Scroll on for swatches. 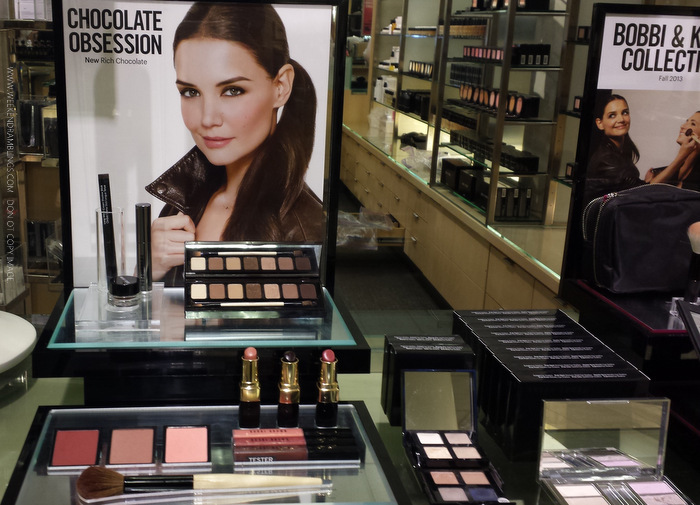 Bobbi Brown Rich Chocolate Makeup Collection is a new capsule collection from the brand. 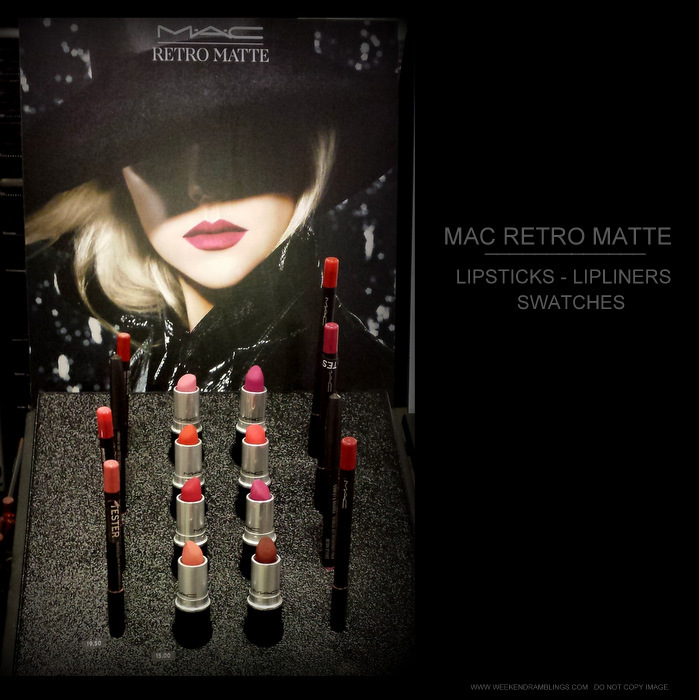 The products included are a mix of already existing permanent range products as well as some new releases. 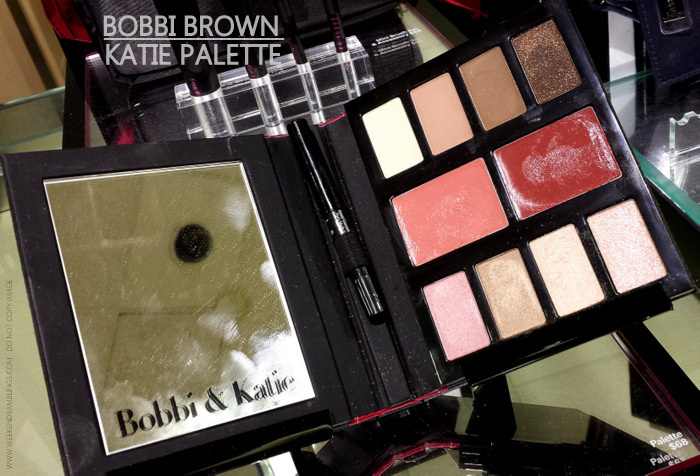 Included in the collection are the Bobbi Brown Rich Chocolate Eyeshadow Palette, lipglosses and lipsticks, a new gel eyeliner - Dark Chocolate Ink, and two blushes. Scroll on for more photos and swatches. Gorgeous shimmer and a high-shine glow is delivered effortlessly to lips with just one stroke of Chanel’s best-selling lip gloss. Available in a wide range of shades, from sheer and natural to sparkling and rich, these look beautiful on their own or over your favorite Chanel lipstick. Equally beautiful is the conditioning formula's comfort and deep hydration. Chanel Levres Scintillantes Glossimer Volupte was released as part of the Roses Ultimes de Chanel Makeup Collection a while back. The color is a light, slightly milky, peach with no shimmer. 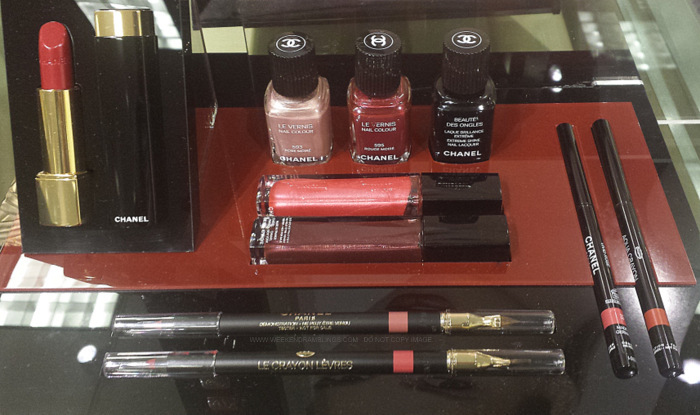 It is slightly sheer - as is normal for a gloss - but it is definitely among the more opaque Chanel glossimers. Scroll on for photos, swatches, and more. Layered with bright florals, citrus and musk for a dazzling lift of life, the fragrance plays upon the skin the way light plays upon the bottle. It dances and shifts in olfactory notes that vary throughout the day. Inspiring the wearer, it interacts with the world as a slightly mischievous yet eternally chic reminder to live every moment in color. Features bold top notes of sparkling mandarin, pink water lily and star anise; a playful heart of tiare flower, golden gardenia and coconut water; and a sophisticated base of sheer amber, radiant musks and Tahitian vanilla. 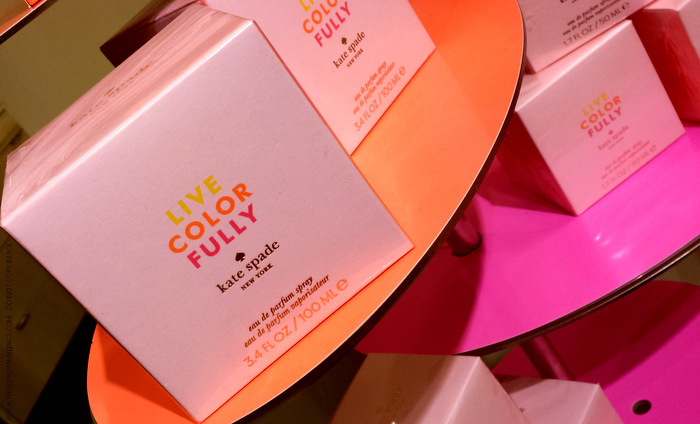 I got a sampler of the new Kate Spade fragrance Live Colorfully Eau de Parfum Spray while shopping at Nordstrom. The only other Kate Spade fragrance I have tried out is Twirl, and this is nothing like that. The official fragrance notes for this perfume include mandarin, tiare flower, gardenia, amber, musk, and vanilla, and the description promises a light, playful, floral scent. The bottle is a hefty bulky square/cube with a bow-shaped gold stopper. Freeman makes some pretty inexpensive face masks and scrubs, and what makes their products truly attractive - to me - is that they are also available in generous single-use packets. I bought a whole lot of them on one of my trips to Walmart (my dentist's office is near one - simple joys in life :P), and I have tried out a lot ever since. The mask I am reviewing today is the Freeman Feeling Beautiful Cucumber Facial Peel-Off Mask. I bought this for about $1, but this mask is also available in a larger (and perhaps more economical) tube for about $4. This cucumber peel-off mask is a runny, clear gel that dries to a translucent plasticky thing that can be ..err..peeled off. Hakuhodo is a Japanese brush manufacturing brand that makes brushes for a lot of big-name makeup brands but also sells brushes under it's own banner. Among these brushes, the ones that caught my eye right away are the ones inspired by Japanese traditions, and the one I am reviewing today is the Hakuhodo Large Pointed Yachiyo (also available in medium and small sizes and non-pointed variety). This brushes is made of white natural bristles - goat hair - and brush head measures about 37 mm in length (according to the Hakuhodo website, haven't measured it myself). The slim handle is wrapped in cane and feels quite light though sturdy. When new - before use - the brush head was longish and somewhat thin but fluffs up into a soft round ball with a wash and use. This buildable, blendable blush hybrid provides the natural look of a cream blush with the long-lasting 14-hour hydrating color of a gel stain. Infused with 50% pure Coconut Water, it instantly hydrates while nourishing with the powerful benefits of Vitamin E-rich Argan Oil. Like a refreshing sip of coconut water for your skin, this moisture-packed blush instantly drenches cheeks in a cool veil of color. Josie Maran Coconut Watercolor Cheek Gelee is a gel-like blush - looks like a wobbly jelly but it doesn't really wobble at all and feels somewhat like a softened balm. It comes packaged in a glass pot and is soft enough to be picked up and applied with fingers. The cheek gelees are available in a variety of colors, and the one I am reviewing today is Getaway Red. The color is a true red that starts light and can be built up to quite an intense red, yet it retains a degree of sheerness even if when it's layered giving it a very natural appearance. Scroll on for more photos.